Church records indicate that the building of St. Joseph’s Church was begun in 1835 and completed in 1842. Fr. Francis Coghlan was instrumental in the building of this church which was then blessed by Dr. Coen, Bishop of Clonfert, on December 4th 1842. This church is situated at the east end of Killimor village in the townland of Garryad. The church and Parochial House stand on about half a statute acre. Old men of the parish maintained that the original plot, given free by Lord Dunsandle, was one statute acre and contained two gardens. The church is cruciform in shape and the building of the tower was occasioned by the fact that in 1895 an anonymous donor presented a 20 cwt. bell. This remained on timber framework until 1904 when the tower, erected at a cost of approximately £300, was prepared to receive it. The bell was blessed by a delegation in 1905. Records state that the cost of the building was defrayed by a parish cess and a bazaar. Assistance was also provided by a charitable donor, Mr. Daniel Nolan, who, the records later indicate, presented the bell. The gilt sanctuary lamp was also presented to the church by Daniel Nolan in 1911. The church was renovated between 1950 and 1952. 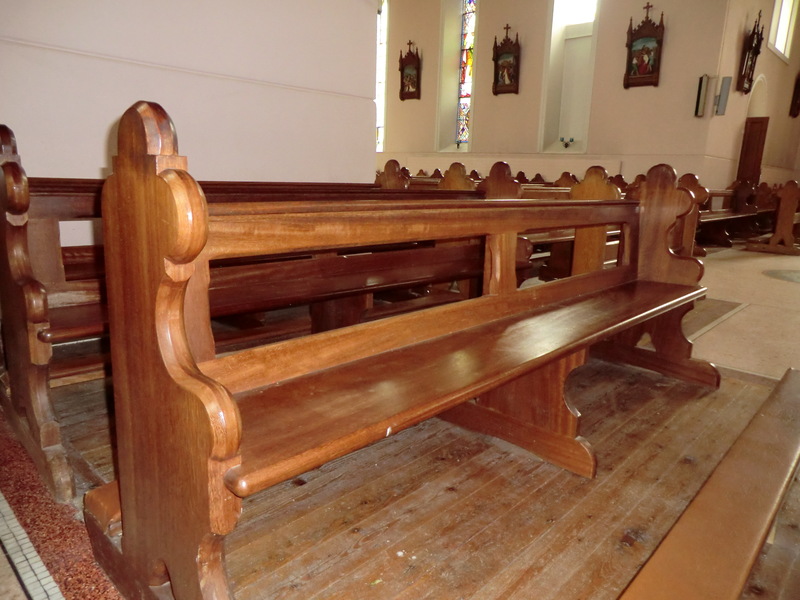 Church Records show that the old timber altar railings were used in the renovation of the gallery, and are still there to this day, forming the protective railing at the front of the gallery. The altar, which was donated by Dr. G. Madden, London (nephew of Fr. J. Madden P.P. Killimor) was consecrated by Most Rev. Dr. Winters in 1955. Windows and seats were donated by Dr. G. Madden and by parishioners. A grotto with a Pieta, sometimes referred to as The Calvary, was erected on the church grounds in 1925 by the people of Killimor, in memory of the late Rev. J.P. Callanan P.P. This grotto was demolished in the early 1980s. 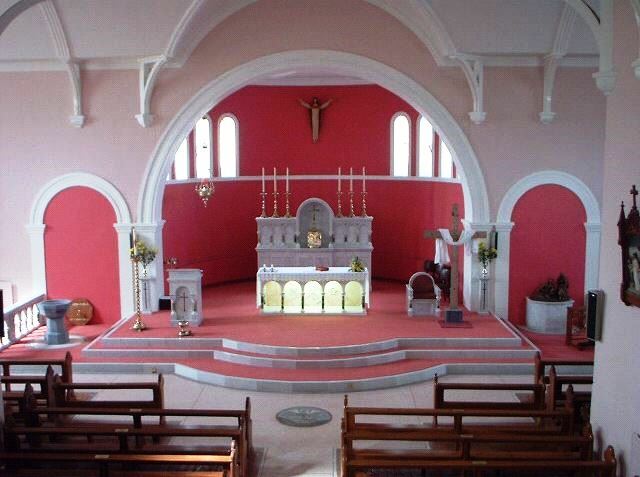 This image shows the refurbished Sanctuary in St. Joseph’s Church, Killimor. This interior renovation was carried out as one of the Jubilee Projects for the year 2000. The objective was to retain all that was good while ensuring that the Sanctuary area is suitable for the celebration of Mass and the administration of the Sacraments. Existing material was recycled and reshaped to suit the new layout, so that nothing was wasted or thrown out. The best artists and tradesmen were employed to carry out the project. Positive comments have been passed such as “bright, beautiful, open, welcoming”. 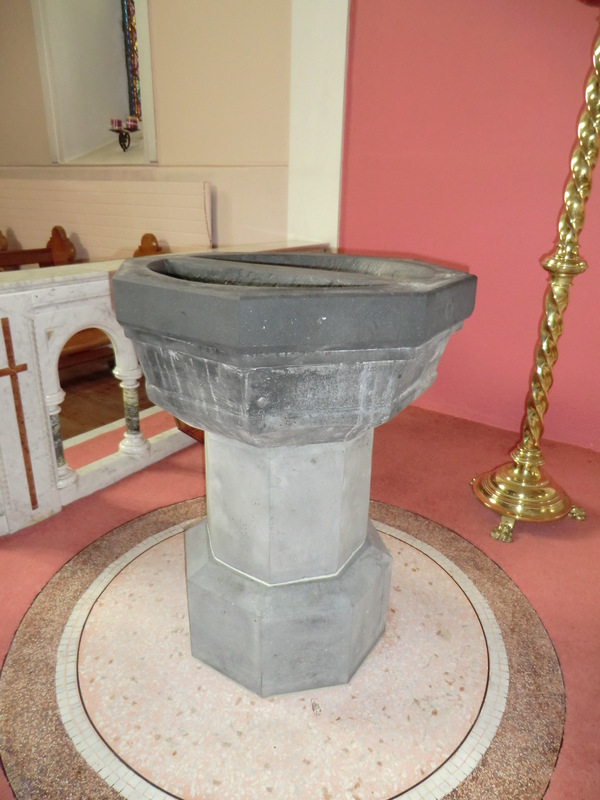 The baptismal font in Killimor church dates from 1835. It is carved from limestone which came from Partry, Co. Mayo. Both base and font are octagonal in shape though not symmetrical. This font was situated for many years at the back of the Church near the main door. 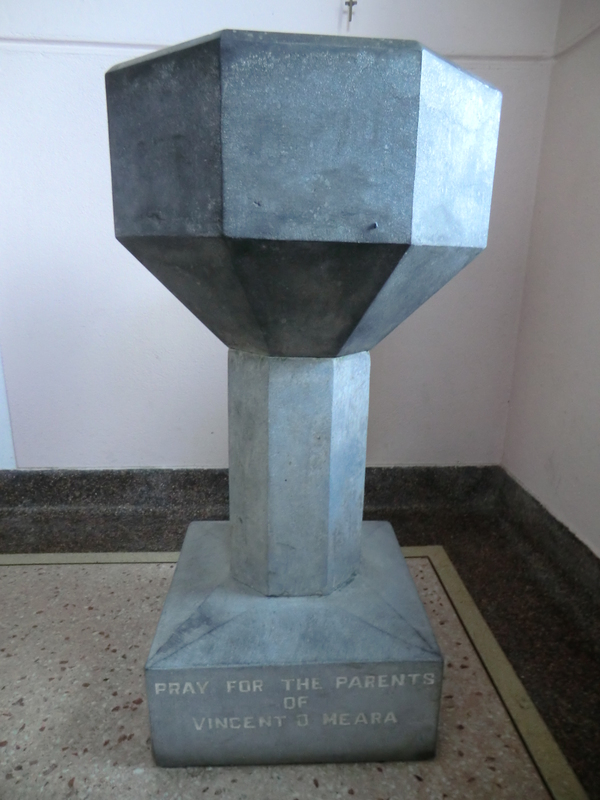 During church renovations it was placed in the sanctuary area, where it still stands. While there are no markings on the Mass Gong (bell) to denote its origins, there is a story built around it. It supposedly came from a monastery in France to a monastery in Galway. 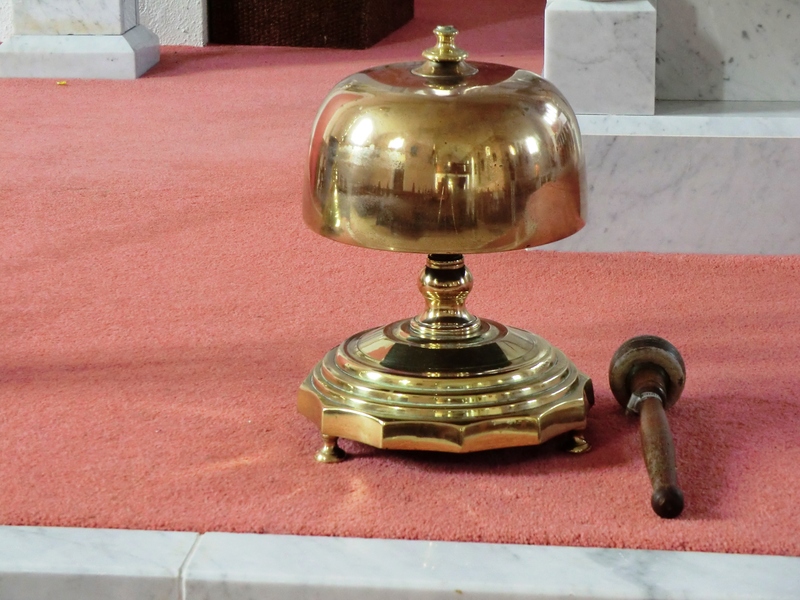 When the Galway monastery was closing down the gong was given to the parish priest, Fr. John Callanan, Killimor, circa 1912-13. Local sources maintain that in the late 1890s, John O’Meara of Killimor presented a granite holy water font to the church which was based in the side porch of what was then called the men’s aisle. It is still there to this day and now bears the inscription: Pray for the Parents of Vincent O’Meara. 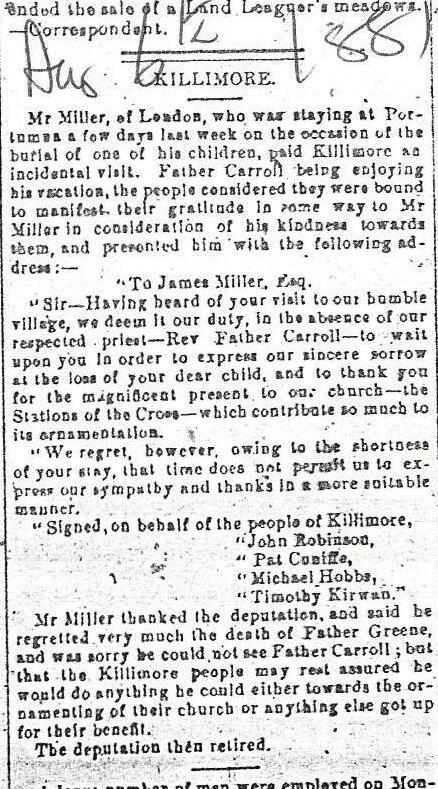 An item in the Western News, dated August 6th 1881, refers to a visit to Killimor by a Mr. James Miller of London. 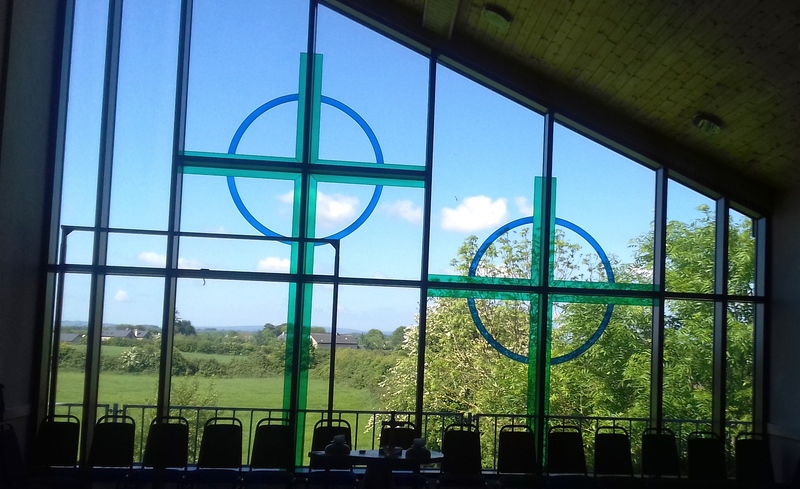 He was addressed ‘on behalf of the people of Killimor’ by John Robinson, Pat Cunniffe, Michael Hobbs and Timothy Kirwan, who thanked him ‘for the magnificent present to our church – the Stations of the Cross – which contribute so much to its ornamentation’. In the year 1907 James MacDermott Esq. Ramore, received from Rome the right of a private oratory, and the grant was submitted to, and approved of, by the Most Rev. Thomas O’Dea D.D., the then Bishop of Clonfert. In the years 1910 and 1911 the church was furnished with two stained glass windows and six ornamental windows. The donors included:- John Robinson, John Kirwan, Michael and Pat Nevin, Mary Finn, James and Mrs. McLernin (sic), Bridget Curley (Larkin), James MacDermott and Miss Mgt. Flood. There were other voluntary contributions from at home and abroad. The church was renovated between 1950 and 1952. Windows and seats were donated by Dr. G. Madden (nephew of Rev. John Madden P.P.) and by parishioners. Left: Dedication reads: Erected to the memory of James and Bridget Kirwan by their devoted son John. Right: Dedication reads: Erected to the memory of John and Kate Robinson by their son John. Erected to the memory of Patrick and Mary Coughlan, Lisdeligna, by their son John. The Parents of Patrick Tierney, Heathlawn. Mrs. Brigid Bohan, Derrysiskle. The Husband & Parents of Mrs. Travers, U.S.A. Rev. Bro. Fintan Egan. James & Mrs. McEvoy, Lisaniska. The Parents of Vincent O’Meara, Killimor. Anthony & Mary Dervan, Ramore. The Parents of M.A. & Mrs. Brody, Killimor. John & Mary Finnerty, Derrada. The Parents of E. Treacy, Ballinahiscragh. John & Mary Daly, Derrada. The Parents of John Joe Fahy, Ramore. The Walsh Family, Loughisle. John Cunniffe, Killimor. The Parents of James Clasby, Moate. Ambrose Treacy, Heathlawn. Lawrence Treacy, Heathlawn. Albert & Terry Larkin, Ramore. John & Mary A. Hanney, Kylemore. The Parents of James Dillon, Lisdeligna. The Parents of James & Mary Hickey. The Parents of Thomas Keary, Kylemore. Michael & Brigid Flannery, Killimor. Patrick & Mary Byrne, Killimor. Thomas & Brigid Mitchell, Cloncona. V. Rev. John Madden, P.P. Killimor. Mary A. Moran, Derrysiskle. 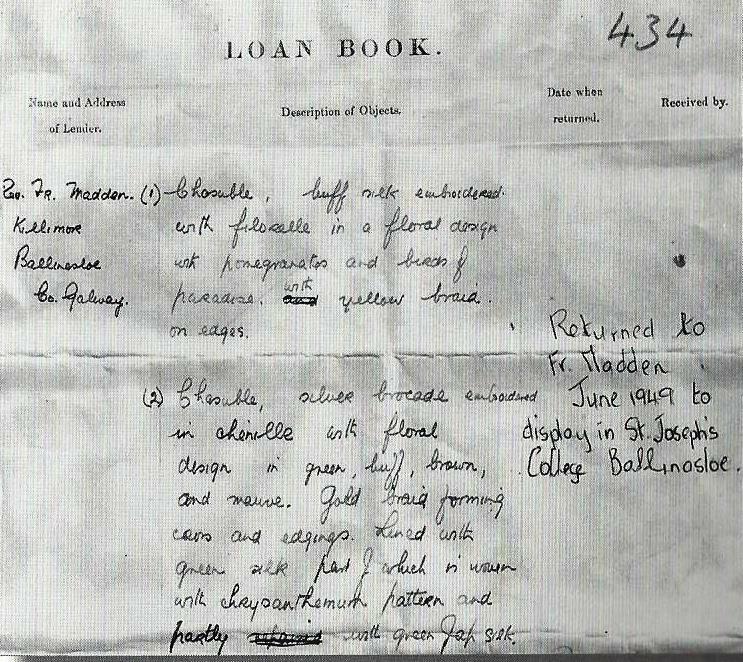 The Parents of John O’Hara, Ramore. 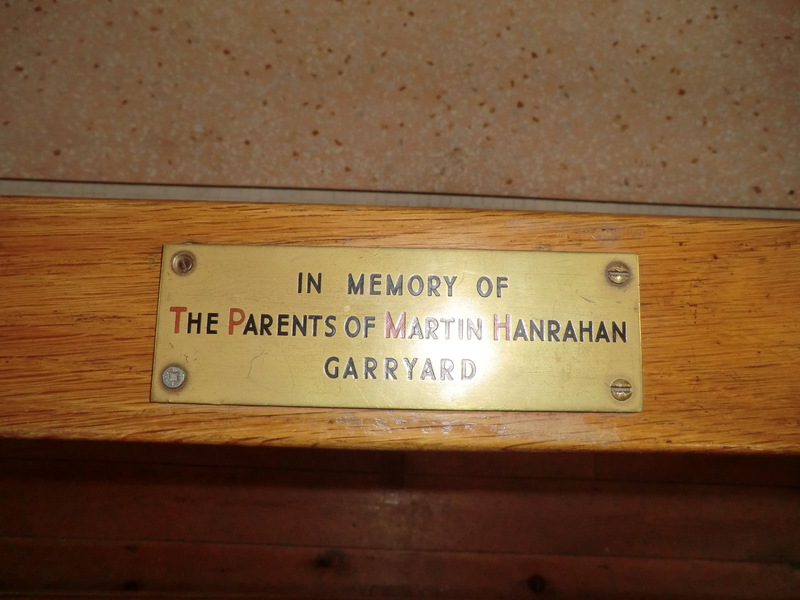 The Parents of Martin Hanrahan, Garryard. Robert & Kate Notley. The Deceased Members of the Briscoe Family, Lisaniska. Patrick Cunningham, Lismihill. Rt. Rev. James Madden, P.P. V.G. Tynagh. The Monaghan Families, Derrew & Lisdeligna. The Deceased Members of the O’Toole Family, Hearnsbrook. Michael Fitzgerald, Ballinahiscragh. The Parents of Michael Kenny, Treen. Peter & Ellen Brien, Lisdeligna. Elizabeth, Patrick & Anne Scully, Cloncona. The Deceased Members of the Burke Family, Hearnsbrook. Annie & Robert Mason. Albie Pender, Killimor. James & Peter Costello, Cloncona. The Dolan & Malone Families. John & Mary Clarke, Lisaniska. John Connor & his Parents, Killimor. Mrs. Ellen Noone, Heathlawn. James Dolan U.S.A. The Parents of Thos. & Mary O’Meara, Killeen. Richard Conway, Ramore. Sheila O’Toole, Hearnsbrook. The Moran Family, Cloncona. The Costello Family, Cloncona. The Hanney Family, Heathlawn. The Hanrahan Family, Ramore. Michael Campbell, Lisaniska. The Treacy Family, Killimor. The Blaney Family, Ramore. Jack McClearn in memory of the Barry Family. The Larkin Family, Lisdeligna. Martin Fahy & Family, Killeen. John & Mary Hobbs, Lisaniska. The Harris Family, Ballinahiscragh. Vincent Donelan & Family, Corr. The Grady Family, Neale, in memory of their Parents. Lord Jesus Have Mercy on the Soul of Harry Curley. Pray for the repose of the Souls of Joseph & Thomas Foley and their Parents. A letter from Ms. Alex Ward, Art and Industrial Division, National Museum of Ireland, states vestments were lent to the Museum in November 1945, by Fr. Madden P.P., Killimor. Fr. Madden requested that the vestments be returned for the celebration of the Silver Jubilee of the consecration of the Bishop, Dr. Dignan, to be held in St. Joseph’s College, Ballinasloe. The return of the vestments from the National Museum appears to have been permanent, and the letter indicates that the Museum supplied a display case so that they could be safely exhibited in St. Joseph’s College. 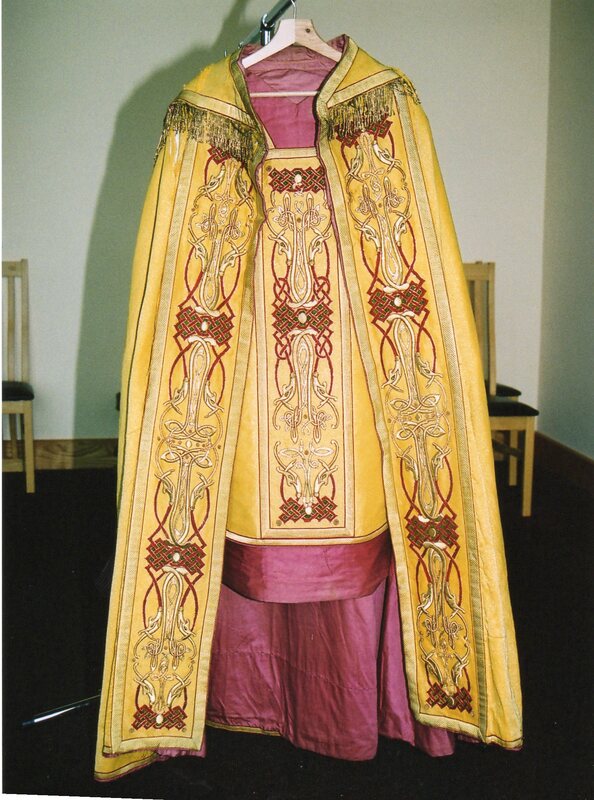 Church records do not clarify if these vestments were bought by, or donated to the parish. Hugh Maguire, from the Hunt Museum, describes the design of the vestments as ‘very distinctive and can’t be before a particular wave of Celtic revivalism late 19th century at the earliest’. Above are two samples of the vestments which are now back in the parish of Killimor. Left: Letter from Ms. Alex Ward, Art and Industrial Division, National Museum of Ireland, sent to Rev. Fr. Madden. Right: Very Rev. John Madden P.P. Killimor, 1930-1951. To commemorate the Redemptorist Mission of 1905, a cross with a life-size image of the Crucified Christ, in cement, was erected in the church grounds. This was later removed and is now in the old cemetery. 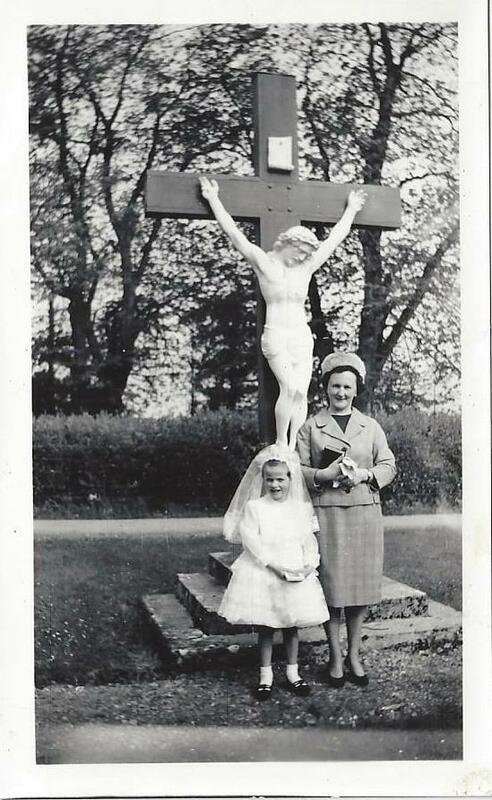 First Communicant with teacher photographed at Crucifix in early 1960s. The following table shows the names of villages and the family names in each village at the Bishop’s Visitation to the parish in 1931, as recorded in church records, Liber Status Animarum, Killimor 1931. It will be noted that in some cases villages were combined for church purposes and not treated separately as part of the forty seven townlands of the civil parish. The spelling of names and villages are exactly as recorded. Death, emigration, allocation of land, and other circumstances caused some family names to die out in many villages down through the years. Keatinge, Moran, Egan/Killeen (from Quansboro), Keatinge, Duffy. Ballinahiscragh: Quirke, Starr, Barry, Mannion, Fitzgerald, Hughes, Harris, Noone, Keary, Tracey. Heathlawn: Hara, McLernan (John), L.Tracey/Muldoon,Keary/Tracey, Hanney, McLernan(James),Whyte,Tierney, Finnerty, Tracey (John). Kelly (Ml. ), Hickey, Clarke, Gordon, Nevills, Kenny, Cunningham. Killeen: Meara, Nevin, McGann (Thos), Kilkenny, Donohoe, McGann (Patrick) McEnaney/Goonan, Fahy. Whitegate & Ballycahill: Geoghegan, Kelly (Patk. ), Shiel, Dillon, Reilly, Callanan, Larkin, Kelly (Michael), Hara, O’Toole, Curley. Cloncona: Bohan, Mitchell, Hearne, Keary, Costelloe, Gormally, Horan, Moran, Head. Killeenamullan & Coolbaun: Whelan, Connors, Mannion, Dervan, Winters, Blaney, Coen, Barrett. Clarary: Fahy, Fergus, Conway, Connors, Bohan, Kane, Larkin. Lisdeligna W.: Brien (John), Brien (Ellen? ), Connaughtin, Burns/Larkin, Tracey, Larkin (Michael), Curley, Fahy, Cunniffe, Coughlan. Lisdeligna E.: Monahan, Martyn, White, Kirwan. Derrysiskle: Cunniffe, Moran, Bohan, Larkin. Derrhue: Cloonan/Rock, Reilly (Mrs. Bgd. ), Monahan, Broderick (Mary), Reilly (John), Kelly, Brien, Greally, Rock (John), Broderick (John), Broderick (Kate). Kylecrow: Larkin/Kenny, Coughlan (Mary), Monahan, White, Lyons. Lisaniska Lower: McEvoy, Hogan, Boland, Haverty, Lowry, Temple, Gibbons, Power, Briscoe, Conroy. Lisaniska Upper: Campbell, Hobbs, Muldoon, Heagney, Callagy, Finnerty, Whelan, Malone, Callanan. Neale: Spring, Grady, Hara (Edw. ), Hara (Ml. ), Hara (Joanna), Hara (Anne). Ahanduff & Sandymount: Killeen/Kennedy, Hannon/Hara, Lantry/Fennessy, Burke, Conway, Grady (Ml. ), Nevin/Quigley, Mannion, Ryan, Lyons, Cunniffe. Corr: Carty, Broderick, Holohan, Duffy, Hanney, Gallagher, Hayes, Forde, Callagy, Head. Garryard & Kiltagour: Hanrahan (Ml. ), Hanrahan (Martin), Dolan, Madden (Patrick), Madden (Andew), Holohan. Killimor South: Flannery, Robinson, Ryan, Matthews, Wynne, Shiel, Cunniffe, (Duffy (Thos. ), Cooney, Foley, Gilloway, Kirwan, Byrne, Soughley, Hobbs, Tracey, Carr, Miss Kelly, Brien, Duffy (Ml. ), Toher, Madden, Holohan (Ml.). Killimor North: Muldoon, O’Toole, Connors, Colgan, Hara, Curley, O’Meara (Ml. ), Fitzpatrick, O’Meara (Vincent), Hobbs, Kelly, Stewart, Pender, Connaughton, Gibbs, Mason, Brody, Duffy, Saunders, Lantry, Dooley, Connaire, Whelan, Porter. Erected by the people of Killimor in memory of the Very Rev. J.P. Callanan P.P.V.F. who for over 25 years was the faithful pastor of Killimor and Tiernascragh. He died at Denver, U.S.A. on the 25th day of April 1923 in the 55th year of his age. In memory of Rev. Hubert Brennan P.P. Killimor & Tiernascragh. Died 13-July 1929. Erected in loving memory of Revd. Michael J Ryan C.C. Killimor who died 19th Feb. 1937. R.I.P. In memory of Rev. J. Madden Killimor & Tiernascragh died 25 April 1951. R.I.P. In ever loving memory of Father Patrick Abberton, P.P. Killimor March 1977. Died 5 February 1978. In ever loving memory of Fr. Hugh Flynn P.P. Killimor. Died 3 July 1981. Died 30th August 1986 at Arus Vianney, Portiuncula Hospital. In loving memory of Very Rev. John Solon, parish priest Killimor 1981—-1994 who died 5th Feb. 1994, aged 72 years. In ever loving memory of Rev. Fr. Oliver Briscoe, Killimor, born Castletown 22nd April 1930. Ordained Carlow 6th January 1954. Died 28th May 2007. 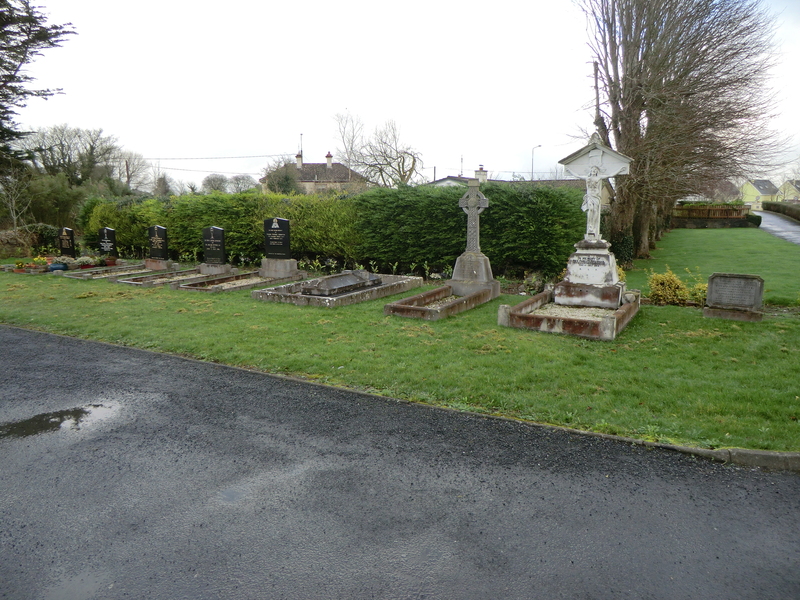 Senior citizens in the parish may recall three slabs in front of the altar, outside the altar rails, under which three parish priests were interred during the 19th century. These slabs commemorating the priests are no longer visible having been covered over during church renovations. Fortunately the grave inscriptions were recorded so that these men will not be forgotten and there is now a commemoration plaque on the church wall with their names recorded on it. Rev. John Walsh, Rev. Malachy Green C.C., Rev. Michael Keating. This Church Festival celebrates the Blessed Eucharist as being the Body of Christ and is marked in many countries with a Procession in which the Consecrated Host is carried by a priest through the streets. Each year the Procession took place in Killimor on the Feast of Corpus Christi, which was celebrated on the Thursday after Trinity Sunday. The congregation was marshalled into rows by stewards after the 11 o’clock Mass. The Sacred Host was placed in the monstrance by the priest, who then walked under a canopy which was borne by four men from the community. The Procession advanced from the church, led by some altar servers holding candlesticks with lighted candles, and followed by the men, women and children. Some children were dressed in their white First Communion or Confirmation dresses and veils, and preceded the priest. About six of them faced the Blessed Sacrament, walking backwards and strewing flower petals on the ground from small baskets. Eight members of the L.D.F. (or F.C.A. 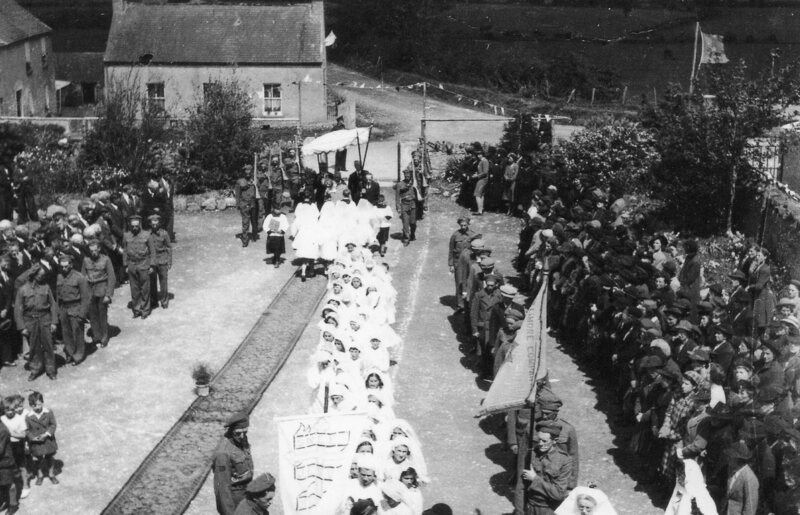 ), carrying rifles, flanked the Blessed Sacrament, four on each side, while others paid their respect by carrying their flag and saluting the Blessed Sacrament. 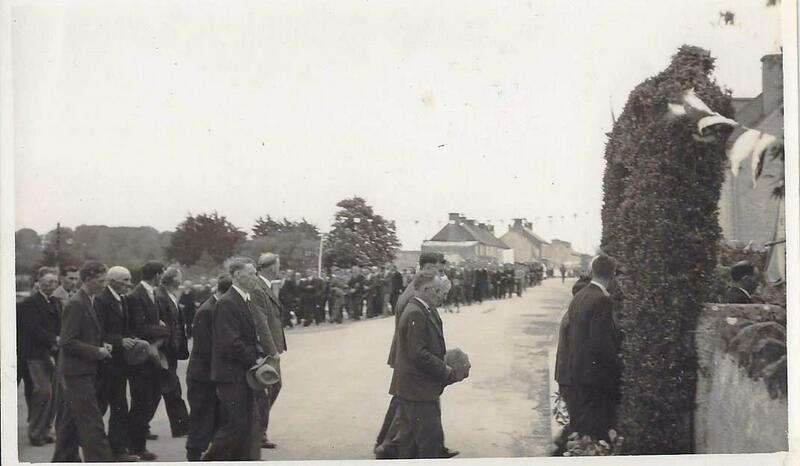 On leaving the church, the Procession walked down the main avenue, through the town and into the school-yard. While processing, the Rosary was recited and hymns were sung, and an aura of devotion permeated the whole atmosphere. Each house in the town was well prepared for the occasion and honoured the day by having a small altar, consisting of statues, holy images and vases of flowers in the window, doorway or outside on the footpath, as well as flying the Papal and National flags from the windows. A temporary altar was erected and decorated by members of the community at the front wall of the old school. On reaching the school-yard the people were marshalled into position each side of the yard, in the middle of which was a long mat stretching from the gate to the altar. The priest and his acolytes walked on this mat towards the altar. The priest then gave the Benediction, recited the Divine Praises, while the choir and congregation sang O Salutaris Hostia, Tantum Ergo and Adoremus. Other hymns sung included Soul of my Saviour, To Jesus’ Heart all-Burning, and Sweet Heart of Jesus. Having participated reverently, the congregation then dispersed. The Procession leaving the church and coming out the main avenue led by some altar servers holding candle sticks with lighted candles, and followed by the men, women and children. One man carries a banner which reads: “COULD YOU NOT WATCH ONE HOUR WITH ME”. Family names in this photo include Colgan, Carr, Hanney, Power, Rocke, Reilly, Cunniffe, Haverty, Burke, and Connaughton. The Procession walking through the town and approaching the school yard. The entrance to the school was decorated with a specially made arch of green foliage. The priest, carrying the Blessed Sacrament and shaded by a canopy, enters the school yard. He is preceded by First Communion and Confirmation children, about six of whom face the Blessed Sacrament, walking backwards and strewing flower pedals on the ground. Eight members of the Local Defence Force, carrying rifles, flank the Blessed Sacrament. All others attending are marshalled into position in the school yard. The priest gives Benediction at a temporary altar erected and decorated by members of the community at the front wall of the old school (not seen in photo). Choir and congregation sing hymns and recite the Divine Praises. 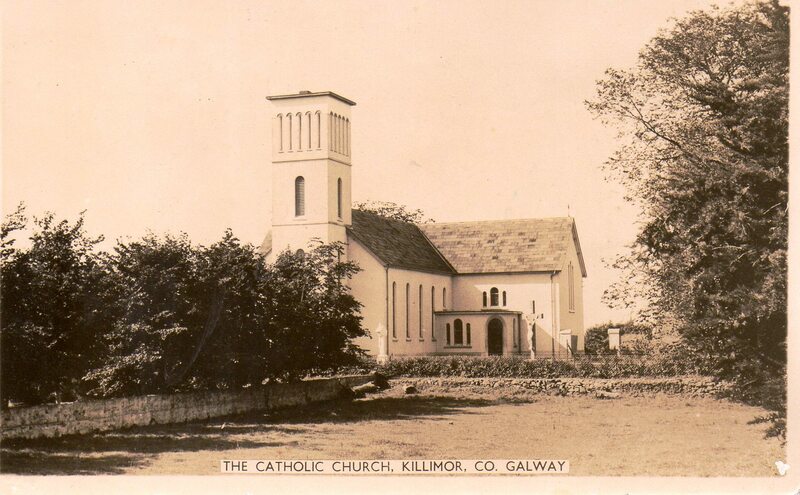 In his book Loughrea A Parish History Declan Kelly states that the Curate’s residence was built in Killimor during the tenure of Fr. Martin Charles O’Farrell 1913-1917. Curates in the parish occupied this house for many years. 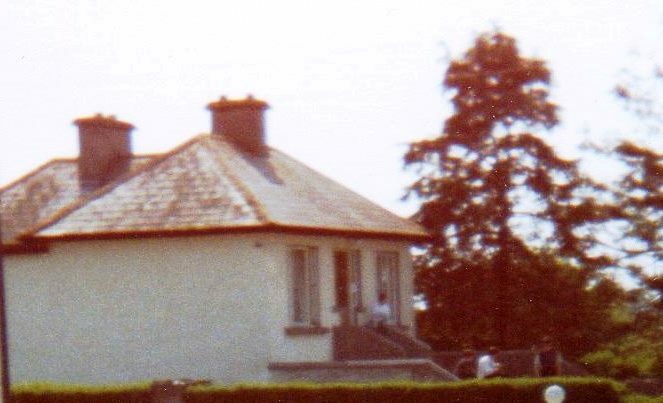 They then lived in Tiernascragh in purpose-built new accommodation. The house was eventually demolished and community houses are now built on the site. Officially blessed and opened by Bishop of Clonfert, John Kirby, Fr. Ciarán Kitching and Fr. Noel Lynch and all who gathered on Sunday August 5th, 2007. This centre, built by the people of the parish, is a place where wholeness is nurtured, hope is affirmed and Christ’s healing is made available to all who have need of it. The Centre contains a Multi-Purpose & Meeting Room, a Meditation and Prayer Room, a Counselling Room, an Office, a Kitchen and Rest Rooms. St. Joseph, the Worker, stands to the left, inside the main door of St. Joseph’s Centre. 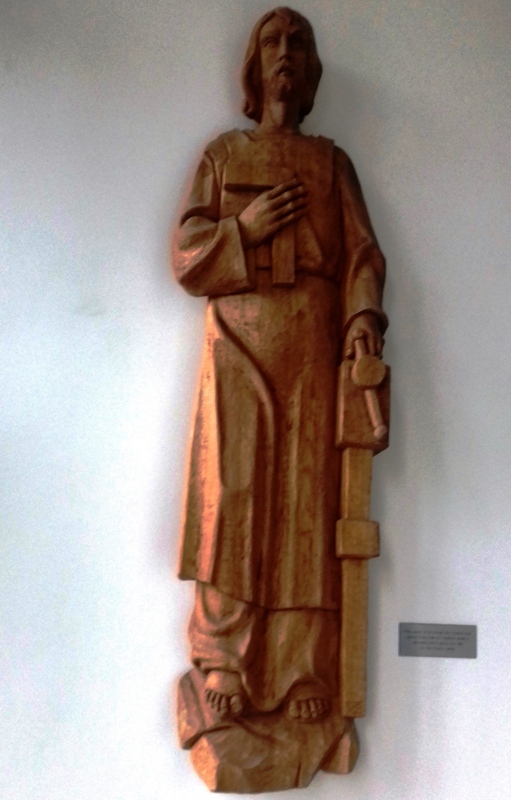 The statue, carved in oak by Vladimir Simik in Slovakia, was donated by Seán Treacy & Family (Treacy’s Public House, Killimor). This image is on the wall of the main entrance to St. Joseph’s Centre. The statue, called “Respect”, was carved from bog oak and donated by Kieran Tuohy, shown here with his wife, Bernadette, née Moran of Derrysiskal, Killimor. The carving now stands in the Prayer/Meditation Room. The window in the Prayer/Meditation Room was a gift from Joan Kinirons to St. Joseph’s Centre. It was erected in remembrance of her uncle Amby. “In loving memory of Ambrose Larkin, Derrysiskal – 22nd November 1903 – 17th May 1998. The following tributes are recorded on the large window of the Multi-Purpose & Meeting Room. Members of Killimor Fás Community Employment Team did much of the work on the building under the supervision of Tony Dervan. Tom Mullarkey was the original architect but sadly passed away before St. Joseph’s Centre was completed. 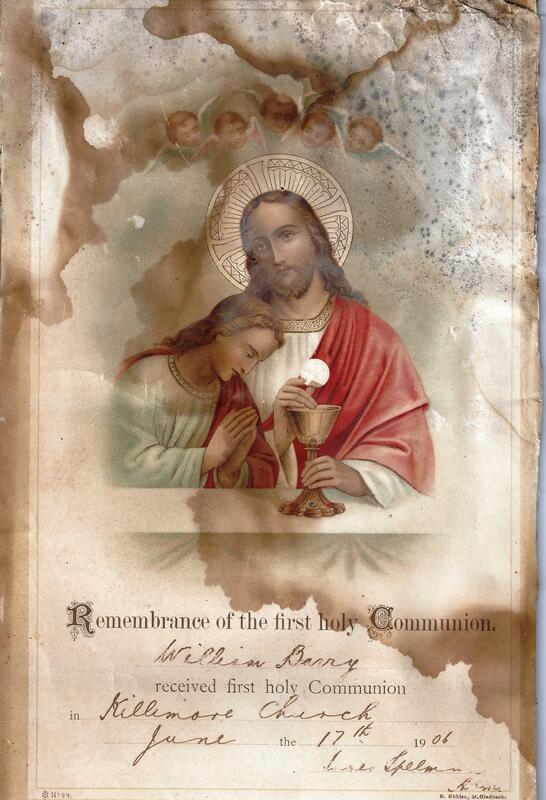 This is an example of a certificate given by the church to children in the early part of the 20th century on the occasion of their First Holy Communion and Confirmation. and was Confirmed 23rd May 1918″. This is a copy of a Baptismal Certificate given out in 1937, in the Parish of Killimor and Tirnascragh, Diocese of Clonfert. It denotes that Brigid, daughter of Hugh Monahan and Brigid Lowry, was baptised according to the rites of the Catholic Church on the 9th day of January 1867. The name of the officiating priest is not given and one sponsor is named, Mrs. P. Monahan. The certificate was signed by J. Madden on 12th day of January 1937. Certificates were given to all people who joined Killimor Branch of the Pioneer Total Abstinence Association of the Sacred Heart. This movement was founded in December 1898 by Fr. James A. Cullen, a Jesuit priest, in St. Francis Zavier Church, Gardiner St., Dublin. The aim was to address the problem of intemperance and alcohol abuse throughout the country. In the Register and Minute Book for Killimor Parish, the first entry was dated 15/2/1933. Patrick Grady got his certificate of membership on 20th March 1944, which was signed by A. Cummins C.C. This certificate shows that William Barry (Ballinahiscragh) received his First Holy Communion in Killimore Church on 17th June 1906. The officiating priest was James Spelman, (Administrator 1906, 1907). The Marriage Register was begun by Rev. Francis J. Coghlan P.P. and was called The Registry of Marriages for the United Parishes of Killimore & Tierenaschra 9th October 1831. Opposite is a copy of the first page of the Register. Stipends paid by the couple to the officiating priest are recorded from October 1831 to February 1835 and then discontinued. These amounts varied from £1.5s.0d. upwards to £6.15s.0d. There are many entries of 5s.0d. which denoted the offering paid for a Marriage Certificate. The page opposite denotes the marriages which took place in the months of February, March, April and May 1845. Below is a sample page for the year 1883 showing some of the marriages in the months of January and February. 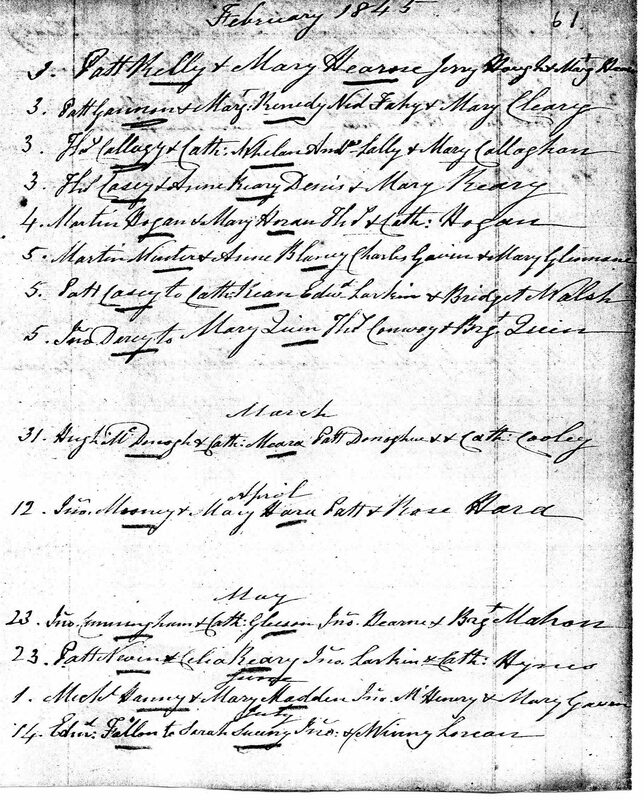 The marriage register now gives the names of the witnesses as well as those of the bride and groom.